A mum had dyed her Great Dane pink and painted her nails, in hopes strangers will stop being so scared of her. 21-year-old Jessica Williams says she noticed strangers were often scared of Great Danes due to their size. To ease strangers’ fears – and to ensure her five-month-old puppy Drama was given heaps of attention when on walks – Jessica decided dyeing her pink would make her more approachable. 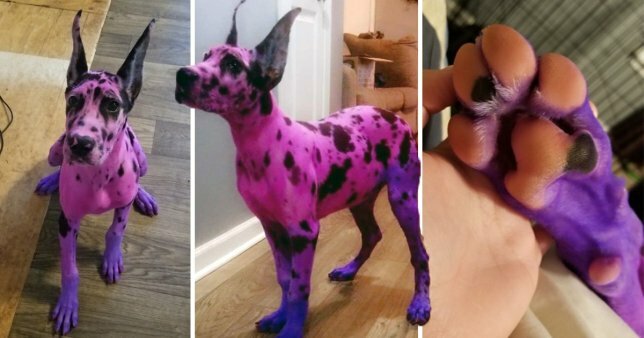 Seeing that her own dog-groomer friend had recently dyed her own dog, Jessica, from Fort Campbell in Kentucky, USA, had the idea to make Drama as inviting as possible – by dyeing her bright pink and purple, and trimming and painting her nails. If she wanted her dog to look less scary then why Crop the ears , all about fashion & the Hive brain. Poor dog!! cropped ears are barbaric.It would have been better to buy a “friendly” harness or neckerchief, this was done for?? fashion?